Founder & CEO, American Foundation for Women's Health and StopAfib.org, Speaker and Author of A Woman's Guide to Saving Her Own Life. Mellanie was intrigued by the potential of pulmonary vein isolation to eliminate her atrial fibrillation, and especially fascinated that the removal of the left atrial appendage could eliminate her stroke risk. March, 2003 — had heart attack symptoms after a flight, was diagnosed with coronary artery blockage and almost died in surgery. October, 2003 (age 51) — after another flight, her heart skipped a beat and spawned blood clots that were a close call for stroke. Beta blocker (Toprol XL™) to stop afib episodes and anticoagulant (Coumadin®) to avoid blood clots — she was never stable on anticoagulant and had terrible side effects. Can't pinpoint — sometimes stress, exercise, or air pressure changes from flying. New research showed some Coumadin® patients are not stable due to genetics — couldn't continue the nightmare for the rest of her life. Mini Maze surgery in September, 2005. With the freedom to go and do without fear and anxiety, she got her life back. After almost dying in emergency heart surgery, Mellanie True Hills left her corporate executive life behind to spread the word about women and heart disease. She says, "Seven months after my initial heart problem, my heart skipped a beat, I became dizzy, my right leg grew cold, and the vision in my right eye grew fuzzy — I had blood clots and a close call with stroke due to atrial fibrillation." Mellanie lived in fear from her atrial fibrillation and being cautious became a priority, "I never knew when an episode would strike — I might be washing the dog or out walking or even on a conference call, and was always afraid. My episodes would start with a skipped heart beat, followed by strong heart palpitations. My heart would race and pound, and then the dizziness would overwhelm me. I would become light-headed, and be afraid of passing out." Once, when out for a walk, her heart rate tripled in moments, and she panicked. "I was a mile from home and felt myself passing out, so I called my husband — though he was there in just minutes, it seemed like hours." Her doctor instructed her to take an extra beta blocker for the episode, and within minutes, her heart was back to normal. After that, she carried a cell phone and beta blocker wherever she went, even to the mailbox. Mellanie relates that, "I was always in fear of my next episode and that I might be driving or off by myself and have a stroke. My family wouldn't let me out of their sight, and traveled with me in the motorhome to speeches and meetings. We planned our travel to always be near hospitals. 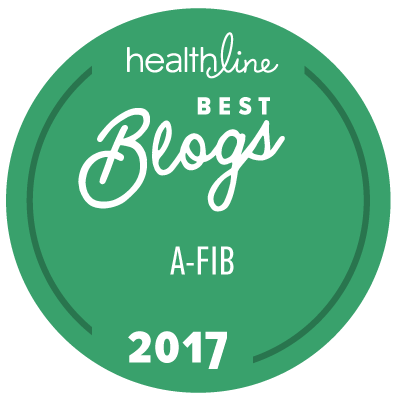 Life wasn't normal as afib took a huge toll on the whole family emotionally, physically, and financially." Weekly blood draws — at home or on the road — to check her blood thickness. Adjusting dosages weekly as she ping-ponged between blood that was too thick (risk of clots) and blood that was too thin (risk of bleeding to death). Avoiding yard work, kitchen knives, and even shaving her legs to keep from being cut. Blood that was too thin leaking from her blood vessels and turning her black, blue, and purple on her arms, legs, torso, and even her face. She says, "My family was embarrassed to take me anywhere." Being chided for not eating right to keep her Coumadin® stable — even though she was eating right, it didn't help. "When research came out saying that about one-fourth of Coumadin® patients aren't stable for genetic reasons, I knew that I couldn't continue this nightmare for the rest of my life," she shares. Though catheter ablation was an option, she learned that at the time the results weren't that strong. Then she discovered minimally-invasive (Mini-Maze) surgery. After researching it, discussing it with her doctor, and asking for a referral, she met with the cardiac surgeons to understand the procedure and address her endless questions. "It was a no-brainer — I was intrigued by the potential of pulmonary vein isolation to eliminate my atrial fibrillation, and especially fascinated that the removal of the left atrial appendage could eliminate my stroke risk." On September 13, 2005, Mellanie had Mini-Maze surgery and says, "Though it was surgery, with risks and anesthesia, and was in an area that is very delicate for women, I have no regrets." She had been grounded from flying for two years, and was now able to fly again and travel by herself. She says, "You can't put a price on getting your freedom back."